Remove the lower shaft assembly bolt and position the lower shaft assembly out of the way. Refer to ST- 12, "Removal and Installation". Spiral cable may be cut if steering wheel turns while separating steering column assembly and steering gear assembly. Always fix the steering wheel using string to avoid turning. 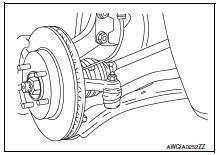 Place a matching mark on both intermediate shaft and steering gear assembly before removing intermediate shaft. Remove wheels and tires using power tool. Refer to WT-47, "Adjustment". Remove steering outer socket from steering knuckle so as not to damage ball joint boot using Tool. Temporarily tighten the nut to prevent damage to threads and to prevent the Tool from a sudden drop. 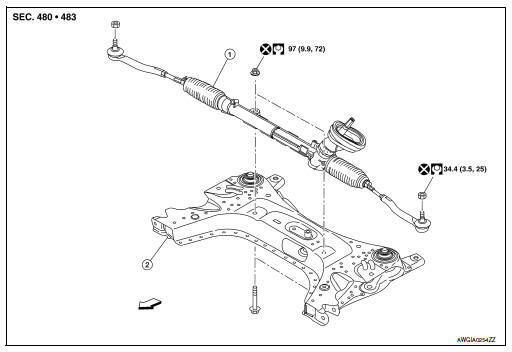 Remove front suspension member. Refer to FSU-16, "Removal and Installation". Remove steering gear assembly from front suspension member. Perform final tightening of nuts and bolts on each part under unladen conditions with tires on level ground when removing steering gear assembly. Check wheel alignment. Refer to FSU-7, "Adjustment". Rotate steering wheel to check for decentered condition, binding, noise or excessive steering effort. Do not reuse steering outer socket nut and steering gear assembly nut. Perform neutral position steering angle adjustment. Refer to BRC-54, "Work Procedure".